What's the one subject Andy Warhol forgot to paint? Hippos!!! Here we fix that with our homage to Warhol's silk screened portraits. 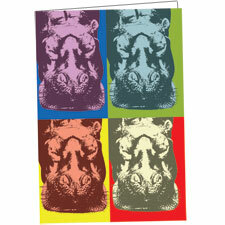 A hippo head is repeated in four colorways to create a vibrant, exciting note card, perfect for any occasion.